This week's show is going to the dogs! We'll also have a musical housewarming, we'll do some wondering, we'll keep-a-goin' and try to solve a crime. 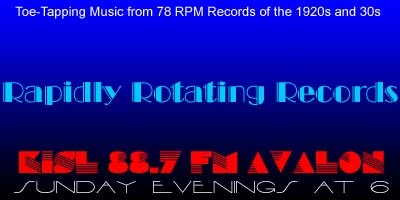 And more than one of the records on tonight's show is making it's Rapidly Rotating Records debut. We're also proud and happy to now be rebroadcast over Global Community Radio! We're on GCR's music channel GRC-2 and can be heard on the University of Wisconsin's station WRST-FM 90.3 in Oshkosh at www.wrst.org. You can find out more about Global Community Radio at globalcommunityradio.blogspot.com. Dream House – Abe Lyman's California Orchestra / Unidentified, v.
The Little White House (At The End Of Honeymoon Lane) – Tom Stacks and His Minutemen / Tom Stacks, v.
A White House Of Our Own – Paul Whiteman AHO / Jack Fulton, v.
Get Goin' – Adrian Rollini Orchestra / Chick Bullock, v.
I'm Looking Forward To Goin' Back Home – Eddy Duchin AHO / Lew Sherwood, v.
Somebody Stole My Gal – Ted Lewis and His Band / Ted Lewis, v.
Found My Gal – Tal Henry and His North Carolinians / Harold Madsen, v.